Nations around the world have rallied to express solidarity with the oppressed Palestinian people on the international Quds Day on the last Friday of the holy month of Ramadan. 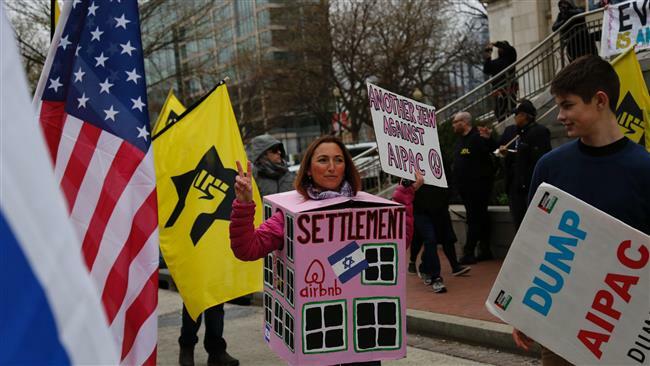 However, Israel continues its illegal settlement activities and puts more pressure on the Palestinians. To discuss the future of Palestine, Press TV has interviewed Alison Weir, executive director of If Americans Knew from San Francisco, and Geoffrey Alderman, author, historian and political commentator from London. Weir stipulated that the rise of awareness among the American people is a factor, which could be helpful for ending crisis in Palestine, arguing that there is a way for peace in the Middle East and that is “the Americans start to wake up to the facts” on the ground in Palestine. “When the American public comes in to play as it is increasingly doing and stands on the side of justice and fairness to even out the power dimension instead of giving Israel a blank check to do whatever it wants, at that point, there will be the first time in history honest negotiations between Israelis and Palestinians,” she said on Thursday night. The analyst also touched upon the stance of US administrations toward peace process in the Middle East. US presidents may think they could bring peace to the Middle East, but “they quickly learn that the actions that they are hoping to take to stop settlement expansion and stop Israel’s constant ethnic cleansing won’t be possible,” Weir said. She further expressed doubt about the intention of the Al Saud regime for proposing a peace plan. “It needs to be an agreement from among the parties involved not the Saudis. They are not Palestinians,” she said. Geoffrey Alderman, another panelist, said with President Trump in the White House, Israel has basically a firm friend, which has altered the dynamic of peacemaking in the Middle East. The analyst explained that a peace proposal from the White House may not bring peace to Palestine.